Washington, D.C. – California drivers have saved $154 billion on auto insurance alone since voters enacted Proposition 103 in 1988, according to an analysis by Consumer Federation of America (CFA). Thirty years after that “voter revolt” against high insurance rates, no state has seen smaller increases in auto insurance expenditures than California, which has also become the nation’s second most competitive auto insurance market. For the liability insurance coverage that state law requires all drivers to purchase, Californians have seen the average premium drop since the enactment of Prop 103, while drivers around the country pay significantly higher prices. Consumer Federation of America (CFA) is releasing these findings in advance of an update of research into the nation’s auto insurance regulatory systems that CFA conducts every five years. 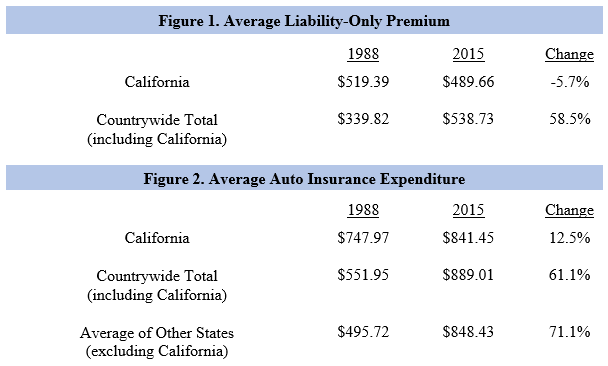 Using 2015 data from the National Association of Insurance Commissioners (NAIC), the most recent available as the research was undertaken, CFA calculated the change in both total auto insurance expenditures – the average drivers spend on all coverages – and auto liability premiums in California since Prop 103 took effect in 1989 and compared that with changes in insurance rates countrywide and state by state. Under Proposition 103, California employs the nation’s most rigorous prior approval system of rate regulation, which requires insurance companies to justify any rate changes before they can be charged to customers. Liability auto insurance premiums (i.e., excluding comprehensive and collision coverage) in California have dropped by 5.7% since 1989, while drivers nationwide face premiums that have grown by 58.5%. The average total auto insurance expenditure of Californians has only risen by 12.5% since Prop 103 passed, while average expenditures of all drivers countrywide (including Californians) have risen by 61.1%. While Californians spent $93.48 more on all coverages in 2015 than they did in 1989, drivers in all other states spent, on average, $352.71 more in 2015 than 1989. Before Prop 103, Californians spent 36% more on auto insurance than the national average, now Californians spend 5% less than the national average. For liability-only coverage, California premiums were 53% above the national average before Prop 103, now they are 9% below average. By comparing California premiums in 2015 after 27 years of Prop 103 with what they would have been if, instead, California premiums simply followed the national average growth, CFA calculates that Californians have saved $154 billion on their auto insurance premiums, or an average savings of nearly $6 billion each year. One of the arguments that opponents of insurance consumer protections, and Prop 103 specifically, have often made is that stringent regulation of auto insurance rates inhibits competition in the marketplace. As part of its ongoing analysis of regulatory practices around the country, CFA used the federal test for market concentration – the Herfindahl-Hirshman Index (HHI) – to determine the state of competition in California’s auto insurance market. Lower HHI scores indicate more competition in a market, and a higher HHI score is a key sign that a market is not optimally competitive. California’s auto insurance market scores a 723 on the HHI, the second lowest in the nation, indicating a high level of competition. The average HHI among all states is 1059. California, under Proposition 103, sets the standard and provides the model for insurance consumer protections, according to CFA. CFA says that in addition to Prop 103’s strong prior approval system, which applies to home, rental, business and other forms of property-casualty insurance as well as auto, and its auto insurance rating rules, there are several other elements of the law have made Prop 103 uniquely effective compared with other insurance systems around the country. CFA highlights the direct accountability of the Insurance Commissioner to the voters – Prop 103 converted the Commissioner to an elected position – and the public participation rules in Prop 103 that have encouraged nonprofit organizations to build up consumer-oriented insurance expertise over the years as key features that have led to the “best in nation” results found in its research. CFA will release its full report on the nation’s auto regulatory situation later in the year. It will contain significant data about the auto insurance markets in California and throughout the country. A series of additional auto insurance studies released by CFA is available here.